Cub Scouts go fishing, build rockets, eat s’mores, and make friends. Plus, there’s the pinnacle of most Cub Scout years – the Pinewood Derby! Cub Scouts earn recognition while doing fun activities with their family, using a handbook as their guide. Get to know your child’s friends and their families as part of a den made up of similar age children. Cub Scout dens (grade specific) meet either weekly or every other week. Cub Scout Packs (all dens together) meet once a month to showcase activities and receive awards, sometimes joined by special guests like magicians, zookeepers, or fireman. Children ages 5-10 or in elementary school grade Kindergarten-5th grade can join Cub Scouts. The membership fee to join Cub Scouts is $40 per year. Other costs for uniforms, activities, camp, etc. are not included in the membership fee. Fundraising programs are available to help keep costs low. Cub Scouting engages the family. Working together, you will complete and sign off on the requirements found in the Cub Scout’s handbook – from doing a magic trick to creating a fire-escape plan for the family home. Scouting is a volunteer-led program. Each Scout pack is sponsored by a local community organization. Parents are welcome and encouraged to get involved as a pack leader or volunteer. Parents and the community organization select pack leaders. Scout leaders have the opportunity to work with children and their families, improving the community through fun-filled activities that teach values of the Scout Oath and Law. 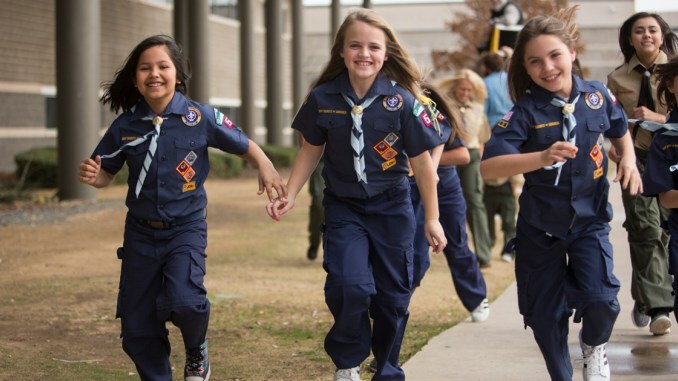 By serving as a leader you can help make a positive difference in the kind of adults Scouts grow into.